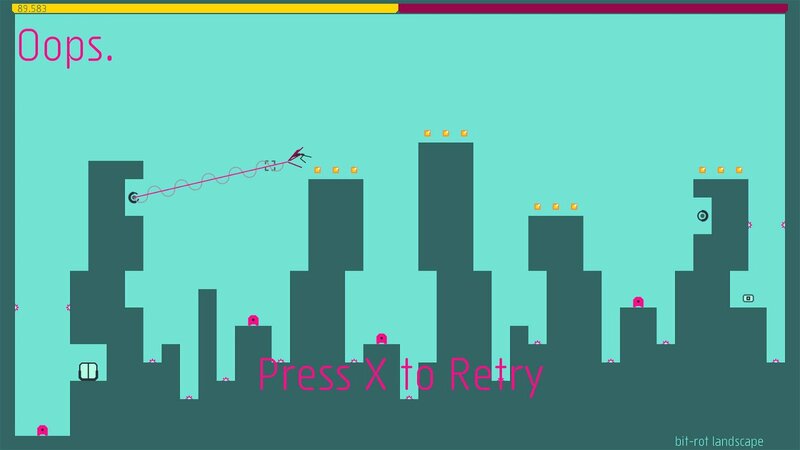 N++ is a 2-dimensional physics-based platformer for the PlayStation 4 that has you take on the role of a small ninja. You find yourself locked in a series of kill rooms, which as the name suggests, are designed to end you—violently. Think of the SAW franchise, but far simpler and less disgusting due to a lack of disturbing imagery; however, like the SAW franchise, you have many weaknesses: exploding rockets, landmines, lasers, killer robots, etc. Unfortunately, your biggest weakness is a character flaw that manifests as a greed for gold. As you may have guessed by now, the kill rooms have been laced with gold; therefore, your real goal is to take all the gold with you as you make your escape from each room. N++ is also Metanet Software’s third attempt to make this particular game. The original N was a freeware PC title released in 2005, and you can still play it online today. In 2008, a polished sequel called N+ was released on the Xbox360, PSP, and the original DS. 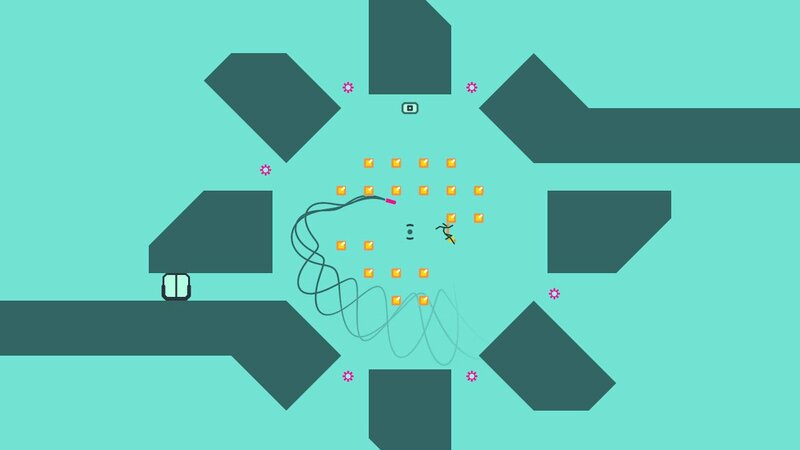 N++ is the definition of iteration, since Toronto-based Metanet Software took the original N game and changing very little of the core gameplay. Instead, they clearly spent all of their time polishing N++ until their hands bled. I apologize for this polish pun, but it’s not the gameplay that makes N++ really shine. The core gameplay is more-or-less the same as it was in 2005, but the depth of customization is breathtaking. The many ways that you can approach the levels of N++ are really impressive. It gets so deep that you can set the game to rotate levels randomly while also swapping out N++’s normal grey on grey colour scheme for a new colour palette every time a new level starts. The physics of this physics-based platformer are solid as well, and so are the controls. That might sound like I am randomly tossing one idea onto the end of another, but the physics and controls have one thing in common: they’re two core elements of N++ which can easily determine the success of the final product. Luckily, N++ is challenging and unforgiving, but I never failed because the controls were not responsive enough. It’s true that I did fail a lot, but it was never because the physics were uneven or unfair. N++ also comes with its standard singleplayer mode, but you can now race to the finish line (also known as the door) in a competitive mode as well. There is even a co-operative mode for those who are looking for team building exercises. To be honest, I feel like Metanet Software made a huge mistake only adding local (or couch) multiplayer to N++. Online racing against strangers would have been satisfying for sure, and I can think of more than one distant friend who I would enjoy completing co-op levels with. With over 2000 levels in the shipping product, there would have been lots of co-op to be had, as well, but that’s not necessarily a good thing. 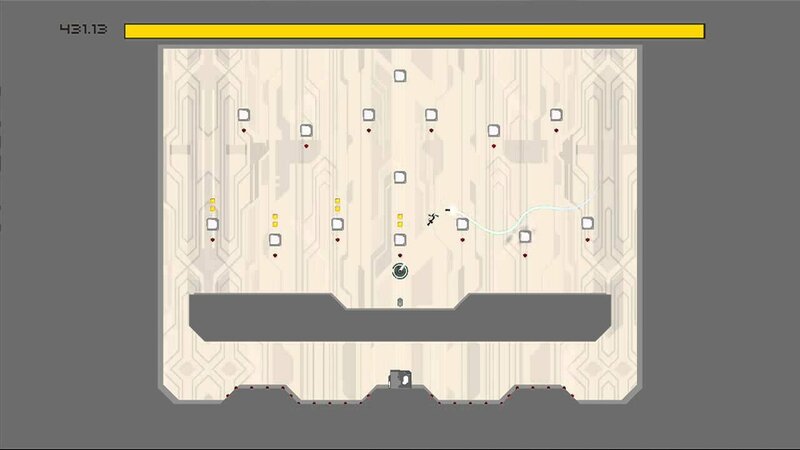 You see, the level design of N++ is what brings me the biggest joy and the most frustration in this game. I know that the people at Metanet Software poured their heart and soul into creating the 2000 or so levels that come with the game, but N++ has an issue with pacing. There is a very slow progression that starts with a series of stationary mines and eventually elevates to that feeling you only get when dodging lasers and killer robots as rockets blow up all around you. That’s why I appreciated the community maps so much: it’s a much shorter ramp up to maps were all you can do is run from as many lasers and rockets some disturbed map creator could fit into a room. On top of that, while Metanet Software is very attached to the combination of steal the gold, unlock the door, and escape, the community has embraced far more independent thinking. There are maps were a set of bounce pads rockets the ninja around in impressive ways. There are maps where people have created scannable QR codes by hand, and my favorite map even had me running away from clones of my ninja who tried to chase me down and end me. To be fair, the clones I hold so dear are a mechanic made by Metanet Software and used by them in the game. You might be able to interact with them early and often through the game’s random level selector and you will certainly find them in multiple community maps. Eventually, you’ll even find them by starting at level 1 and working you way up; therefore, I am not trying to suggest that N++ has a content issue. Instead, it’s how long it takes for vanilla N++ to get your heart pumping that is the game’s biggest issue. It’s around this point in a review that I normally say that no game is perfect, but N++ is really close. In terms of issues, the only other thing I found was a sound bug that happens on occasion. Every once and a while, the soundtrack would cut out completely and then start up again about 5 seconds later. Whatever the reason for this error, these moments of silence are a little off-putting in a game like N++. In the end, N++ is a solid 8 out of 10. Its “campaign” has some pacing issues, but it is pretty amazing what the community has been able to come up with. I feel that N++ is a game that everyone will be able to have some fun with. How much fun, and for how long, will depend on the person. N++ is also Metanet Software’s third attempt to make this particular game. The original N was a freeware PC title released in 2005, and you can still play it online today.